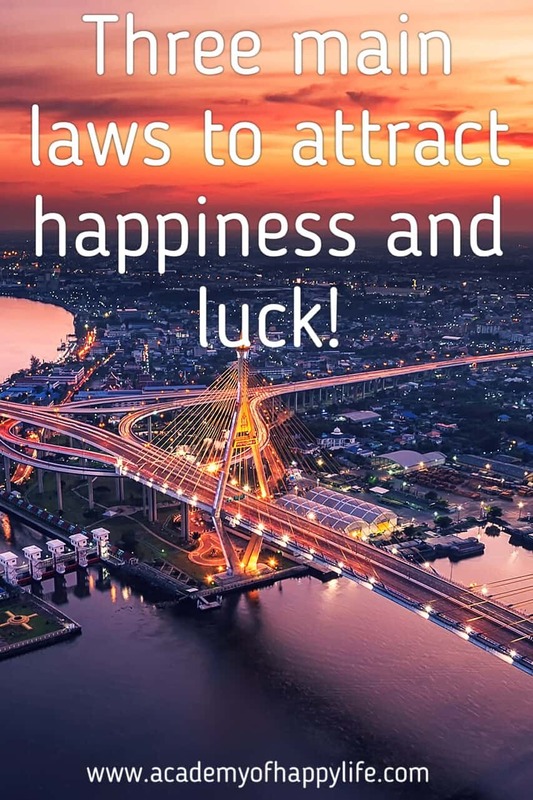 Three main laws to attract happiness and luck! Everybody thinks that it is much easier to have a happy life if you were born in a wealthy family. But the truth is that it is possible for everyone to have a happy and wealthy life, everyone who truly wants it. So many research proves that happiness is not related to money at all. You can be a very rich person but at the same time be very unhappy, and you can come from a poor country and a poor family but feel happiness inside you. According to a recent survey, the happiest people live in Puerto Ricco and Mexico. I am not saying at all that happier people live in the poorest countries, I am just saying that our happiness does not depend on our material status. We can be very happy without any material reasons for our happiness. You might ask: What is the secret of happiness? As for me, for example, I believe in the theory that Australian researchers – creators of the popular movie “The Secret” follow. They insist that our life totally depends on the main law of the Universe – the Law of attraction. This law is very simple and logical: a person attracts in his life the things which he thinks about. Our thoughts are like the signals which we continuously send to the Universe. The universe reacts to them. But unfortunately, the reaction is totally relevant. And when we have some thoughts about the things that we are scared about like some illnesses, sadness, bad luck… then in result we receive them in our life. Our thoughts are like magnets, what we think is what we receive, It is impossible to be happy and continuously think how much you are unhappy, not loved and poor. If you think this way, you will be this way. The Universe takes your thoughts as orders, and you receive everything you are sure about. But the magnetic energy of our thoughts can make everybody happy, you just need to have the right thoughts. 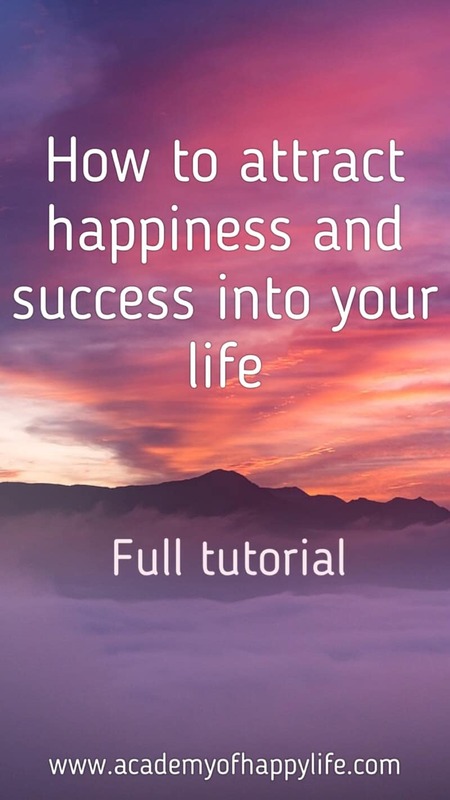 The thoughts about happiness, luck and love, and you should control your thoughts continuously…. A person who is filled with love will attract the love of other people. This is one of the most important laws of attraction. All the people, things and situations in our life are not a coincidence. We surround ourselves with them, either we want it or not. Every morning, wake up with a smile on your face. Think about the happy day waiting for you today. Learn to be happy in every situation. In that case, positive emotions will win over negative emotions in your life. Surround yourself only with positive people. Learn how to be interesting for yourself. Every day, work on your self-improvement, read new books, attend interesting lectures, courses, learn something new… Remember, a person who is not bored with himself will attract more interest from other people. Do these things which bring happiness, love, and satisfaction to you. Of course, you will meet some difficult people in your life, as well as some difficult tasks, which you don’t want to do. But in that case, try to see some positivity in it too, like seeing it as a new experience which can be very useful in the future. Never have doubts in your exclusivity. Every person is unique and deserves love and respect for it. Don’t criticise yourself, don’t be angry at yourself. Be proud of yourself, love yourself as you are and you will see positive changes around you. Don’t let your inside harmony be disturbed. If you are feeling some fear, anger, sadness or any other negative emotions, immediately stop thinking about what’s disturbing you and think about something positive instead, to give you positive emotions: think about someone you love, remember some happy moments in your life, some things which bring you happiness… This way you can protect yourself from troubles which could be attracted by the negative thoughts. Delete all photos which bring you sadness and negative thoughts, such as ex-loved people, or some people with whom you are not good friends anymore. Delete the photos from your phone so there will be no chance to see them by coincidence. Specialists in Feng Shuy insist that when you get rid of photos that can remind you of bad relationships or memories, you close these relationships in your soul and start new and happy relationships. Dream about love. Of course, you should visualize your second half in deep details. Imagine how you spend time together feeling love and happiness. Believe me, the Universe will see it and your wishes will be heard. Create a map of wishes. If love is one of the top and most important priorities in your life, put a photo of a person who is the most similar to your dream life partner in the middle of the map. Make that photo much bigger compared to the other ones and surround it with all the thing that will make your life together happy and beautiful: house, car, children etc. Put this map somewhere where you will be able to see it every day. Look at it every day and visualize. Visualization is the most powerful tool to make your dream come true. Remember this: “The majority of people are happy as much as they decide to be happy”. Never keep the old offenses from your ex-loved. Offenses, even in your inner mind, block opportunities for positive changes in your life. Never say to yourself: I will not be able to do it. Having faith in your capabilities is the most important factor in your success. A happy person lives much longer and has a much healthier life. Scientists prove that the metabolism of the human body is controlled by the central nervous system which reflects our thought during our life. For example, if a person is convinced that after 50 years old, he/she will start looking much older and will start having a lot of health problems, then this will happen in his/her life. At the same time, his/her relative might be totally healthy, looking younger and enjoying life at the same age. Create your own scenario of age changes in your life. Imagine how you will look at 30, 40, 50, 60 years old… Choose the perfect option where you will look much younger and much healthier compared to other people at that particular age. This task will help you look younger and healthier at that age. Try to avoid stress. If you are in some negative situation, just try to compare it to your life, and you will see how short this situation is, compared to your whole life. Try to see the problem from the philosophic side, remember what was written on King Solomon’s ring: “This too shall pass”. Be good with people. Try to forgive them for their mistakes – and you will see how better your health will become. Forgiveness makes you free and heals your soul. Everything you do in life, try to do it calmly and not in rush. When we are doing something in a rush, our body pumps a high dose of adrenaline, which has very bad side effects on the heart as it pushes it to work much faster than usual. Try to receive positive emotions as much as possible. It is a proved fact that optimistic people live longer and look younger compared to pessimistic people. Positive emotions make your immunity stronger and help you look younger. The worst feelings for your health are – anger, feeling blamed and not happy and peaceful with yourself and your surroundings. Remember, your health starts from your love to yourself and your closest people. Smile as often as you can. Researchers show us that when we smile, we have a higher blood pressure in our veins, which is a very good prophylactic for a lot of heart issues. At the other hand, negative emotions make our body struggle. Learn how to relax. Try to find time for yourself. The best time is before bed. Try to find at least 10-15 minutes a day just to relax and do what makes your soul happy. Meditate, pray, listen to some good relaxing music, and practice anything you enjoy. The most important is that you feel comfort and harmony during that moment. Try to relax, don’t think about anything that can make you unhappy or disturb your soul. Specialists are sure that these few minutes help your body to recover from daily stress. Make a rule to analyze your own illnesses. All symptoms and illnesses are signs that you are doing something wrong. Pay attention to your actions and thoughts. Even a simple cold does not appear just out of anything. You had to have some anger or offense before. If you would like to read more about it, I strongly recommend reading Louise Hay’s book “Heal your body”. Try to fight bad mood. Don’t let it grow into depression. Psychologists suggest training your “happiness muscles” at least two minutes a day. Smile at your reflection in the mirror, and at the same time think that you are very healthy, beautiful and a very happy person on the Planet. 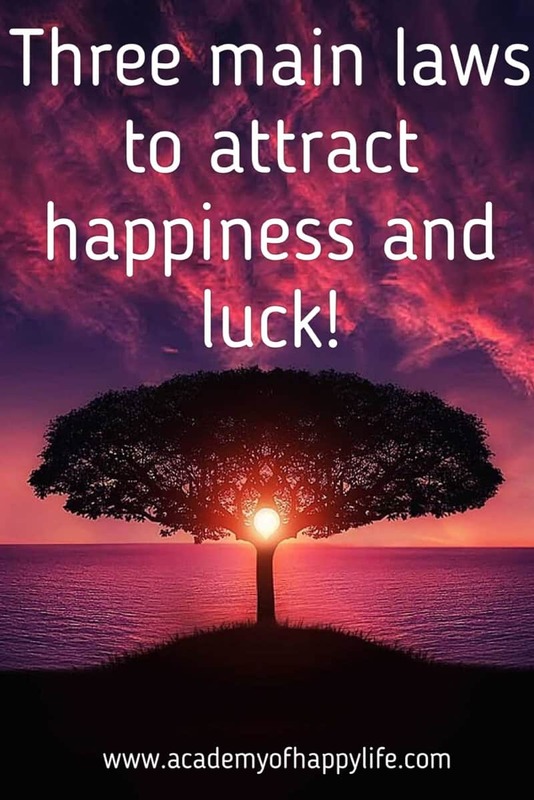 Your soul happiness is the fuel for your luck. Never complain about your illnesses, except to your doctor. The person who continuously complains about his illnesses and continuously talks about them in deep details is the person who contentiously attracts illnesses. Never diagnose yourself. If you say that you might have some certain illness, you will be unconsciously programming yourself for that illness. Never argue with aggressive people. Your health requires calmness and healthy conditions. Aggressiveness is very destructive for your health. Money doesn’t bring happiness, but happiness brings money. A lot of people think that, if they would have a lot of money, they would be truly happy. But this does not happen. The law of attraction works totally the other way around; when you are truly happy, you find wealth and everything you need to be happy. So, try to find the reason why you are not happy, and after you solve this and find happiness, then you can move to wealth. Follow your dreams and the Universe will open doors for you, even if there were walls before. Change your thoughts about wealth. If from childhood you were taught that big money can only be made in illegal ways, then this can be very bad for your future. It can block your opportunity to make a good money in an honest and decent way. Try to remember a different affirmation; money comes easy and regularly. This way you will be able to make money easily. Don’t make money the main goal of your life. First of all, think that you have freedom, which can help you to realize all your plans and become a happy person. Do something that you enjoy doing. This way your work will be your very well-paid hobby, where you receive not just money, but positive emotions, as well as fresh energy. Be tolerant and patient! A lot of people are intolerant, they want to see immediate results. They make a lot of effort to be rich, and they want immediate results, and when it does not happen during that term that they thought it should happen, then they think that this way of making money is not working. So they give up and they lose the chance to make money which they could have made if they would be a bit more tolerant. Remember – money is the energy. It should move. You should learn how to work with it. When you are paying your bills, just remember you should feel good giving it out. Feel that you are helping people when paying your bills and this way your money will come back to you easily. Don’t be greedy. Remember, if you want to buy something cheap, you will pay twice. One of the money attraction laws says that if you spend more, you will attract more. All the time, remember to search for new sources of income. This will help you to be secure in any situation that could arise. Think and feel that you are rich. Behave like you are very rich. Feel wealth, even if at some particular time you might not be as rich as you wish to be, but if you will visualize how you are buying expensive things, believe in it, so you will be rich and able to buy all these things in the future. Visualise money. Visualise that amount of money which will make you happy. Write down some check which you would like to receive, look at it daily and one day you will receive it, but only if you believe that you are able to receive it. A lot of people put limits on themselves. For example, they would like to receive that amount of money, but deep inside, they strongly believe that they are not able to make such a big amount of money in such a short period of time. Don’t set any limits for yourself. You are able to achieve anything you believe in. Don’t forget to say “Thank you” for every good thing that happens in your life. Thankfulness is very-very powerful, it helps you to multiply your success. Change yourself and the world around you will be changed too. Never say “never”. Remember, remove from your life all affirmation that blocks your happiness and success. For example, “I will never be rich”, “I will never get that job”, “I am totally in debt” and so on. With this kind of negative thinking, you will really never achieve any of your dreams. Never collect money for bad situations. If you are doing so, you can be attracting a bad situation to your life, and you are risking to get in a bad situation very soon. Better to collect money for the “pleasant surprises”. Never blame yourself for unplanned spending or for spontaneous purchases. They are your positive emotions, they give more motivation to make more money. Follow us on your favorite social media platform to receive daily motivation and inspiration! Also read it: 10 most common habits of self-made millionaires! Also read it: 25 quotes which will bring happiness to your life! Also read it: 7 rules of successful people! Also read it: 10 main rules for happy relationships! Also read it: 15 best inspirational quotes! Also read it: 7 important questions you should ask yourself every morning! Also read it: The two minutes that will change your life! ← Be happy for this moment. This moment is your life!